Awesome book that speaks to the tremendous work that Temple has done. 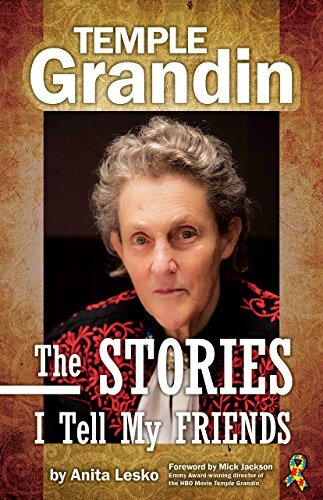 Temple Grandin: The Stories I Tell My Friends is a must-read for anyone interested in Temple or autism. However, this is not the usual book about or by Temple Grandin, so don’t go into this expecting the same level of professional writing as her other books. Temple did not write this book, but it is still very useful and of interest to anyone interested in Temple or autism. Anita Lesko takes recorded conversations with Temple and lots of Temple’s friends and basically transcribes them with comments in between. I’ve read many of Temple’s books and I’ve heard her speak in person. My daughter is autistic, Temple Grandin is one of our heroes, and I still thought the intrusive, amateurish, sometimes gushing narration almost derailed this book. It’s a shame because Anita Lesko has some good information to add to the canon. In addition, the book starts with random childhood memories of pranks and non-autism-specific incidents. Once you get beyond that, the stories are much more interesting and become even more so as the book progresses. By the end of the book, the stories are simply fascinating and offer a lot of insights into Temple and autism from those who know Temple best. If anything, by the time I got to the end of the book, I just wanted it to continue with more reminisces from her students and colleagues. To clarify: I mention the quality of the editing because I want folks to know that you absolutely ought to disregard it and continue reading the book, rather than stopping as some might do not knowing the value of the content. I feel so strongly about the value of this book that I bought a copy even though I received this ebook of it through the publisher on NetGalley. Pros: Lots of good stories about and insights from and about Temple and autism. I’d have liked to have seen even more. It’s very much worth working through the slower parts to get to the meat of this book, which is irreplaceable – adult stories and testimonies from Temple’s mentors, co-workers, friends, and students that relate to her life-driving principles and autism. Cons: It is obvious that Anita, who has autism, did not have the benefit of a professional editor and that’s a major disservice to her and her subject because it’s the gushy amateurish interjections that almost ruin this book. In addition, the book starts out very slowly with mostly generic geeky childhood reminisces, which slow the book to a crawl before it really takes off. Highly recommended for those interested in autism or Temple Grandin with the caveats above.